Look out for precedents and trends involving: foreign invasion and internal greatness; politics, religion and the military; cultural upswings and downswings; wealth and poverty; centrality and marginality; ethnic complexity; conflict between the interests of urban and rural people; good governance and callous overlordship. Iraq stands at the pivot of Eurasia. Two great rivers, the Tigris (Dijlah) and Euphrates (al Furat), provide trade routes from Syria and Turkey to the Persian Gulf, bringing mountain water to an otherwise dry Mesopotamia. Downstream, the Persian Gulf offers sea links to India, the Far East and Africa. 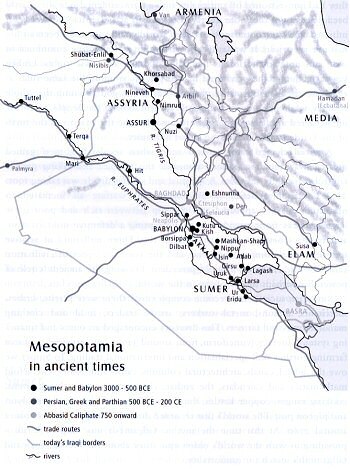 Mesopotamia is 'the land between the rivers'. Land routes meet here from Iran, India and China to the east, the Caucasus and Russia to the north, Turkey and Syria to the northwest, Palestine and Egypt westwards and Arabia to the south. Throughout history Iraq has been a shipment, trading, pilgrimage, invasion and raiding centre where the latest goods, ideas and people from across the Old World have met up. Its people are very mixed, arriving and interbreeding over many millennia. Even the Vikings left their seed here, while trading with the Baghdad Caliphate a thousand years ago. People had lived since very early times in northern Iraq and Turkey, one of the world's earliest agricultural regions. Mesopotamia itself was relatively empty, sometimes dry and sometimes flooded, and not an easy place for a simple life. People moved into rainless Mesopotamia from around 5900 BCE. By 5500 they had developed irrigation and drainage systems, making intensive farming possible. Organised labour-forces were needed for earth-moving and building mounds, banks and channels to protect settlements from the devastating floods caused by rain and snow-melt upstream in Turkey and Syria. By 4500 BCE, sails, ploughs and potters' wheels had been invented, and early villages grew into the temple-towns of Sumer, clustered around today's Nasiriyah. Sumer's were not the world's first towns - Jericho had accumulated 1,500 inhabitants by 8000 BCE and Chatal Hüyük in Turkey had 6,000 around 6500 BCE - but Sumer was the first proper urban area and civilisation. According to tradition the first town was Kish, soon outsized by Eridu. These, with Ur, Lagash, Larsa, Uruk, Umma, Nippur and Ubaid made up urban Sumer. The Persian Gulf then stretched 200km (120m) further inland than it does today, and many of these towns were coastal. Around 3200 Uruk had 10,000 inhabitants, swelling to 50,000 within three centuries. The cities were headed by priesthoods who ran the trading and judicial systems, collecting and distributing goods and allocating land and resources. To them, material and spiritual activities were equally sacred - they had not sectioned off spirituality into a transcendental side alley, partly because many of the more depraved of human activities had not yet been initiated, and the contrariness between worldly and spiritual aspects of life had not yet arisen. It was a matrifocal kinship system, quite communal in style and noteworthy for its fair rules of trade and civic rights. Unlike Egypt, in Sumer the privileged had to play by roughly the same rules as everyone else - in Egypt the pharaoh was of the gods, owning the whole country, while in Sumer their priestly leaders were of the people, performing as sacred a role as farmers or artisans. Here lie the origins of the myth of the Garden of Eden and the fall of humanity. A social change came around 2900 when secular 'big men' gained greater sway, building palaces alongside the temples and taking greater control of worldly activities. A spiritual and secular divide was taking root. Trade, weaponry, defensive city walls and warfare all increased in magnitude, slavery appeared and the gap between rich and poor grew larger. Attacks from outside started, prompting a defensive militarisation, and rivalries between cities started up too. Three millennia of relative innocence was coming to an end, and the tawdrier aspect of civilisation came forward. This was a world precedent, breaking the ancient 'circle of power' for perhaps the first time in the world. Sumerian society had become complexified: there were priests, scribes, merchants, masons, metal-workers, artists, traders, food and clothing manufacturers and farmers. This diversity encouraged accounts and financing systems, literacy (cuneiform, from around 3400), law, irrigated intensive farming, further skill-specialisation and international trading. To Sumer we owe the wheel, canals, architectural columns, vaults and domes, twelvefold mathematics and calendars, the zodiac, chariots, cosmetics, brick ovens, cooking ranges, copper kettles, the first schools and libraries, harps, lyres and pigeon post. The world's first recorded doctor, Lulu, practised in Sumer around 2700. At this time the mythic Gilgamesh was king of Uruk - providing us with the world's oldest epic story about the Flood, Noah and Gilgamesh's search for immortality. A further critical change came around 2350 BCE when Lugalzagesi, king of Umma and Uruk, united Sumer after a period of fighting between the cities. Shortly after, in 2334, the world's first imperialist, Sargon of Akkad, appeared in northern Mesopotamia and conquered the whole area. This was not just city- or trade-expansion but the intentional creation of an empire, stretching eventually from the Persian Gulf to the Mediterranean, and lasting 140 years - another world precedent. After its downfall around 2193, followed by a time of chaos and foreign invasion, Ur rose again around 2100, to dominate Mesopotamia for a century. This was the time of the building of the great temple ziggurats of Ur, Eridu, Uruk and Nippur, Sumer's grandest and most advanced period. But the invaders returned. Mesopotamia was wealthy, central and exposed, and it was a rich picking for anyone with the strength to attack it. The Elamites (from near today's Basra) sacked Ur in 2004 and, though Sumerian trading cities continued long after, their 2,000-year pre-eminence declined. This had been a durable civilisation with a civilising effect on peoples far and wide, a centre of invention and initiative, and the true starting place of human civilisation. Two centuries of confusion followed, out of which emerged two powers, Assyria in the north (around today's Mosul, in the hilly, greener area of northern Iraq) and Babylon in the south (near today's al Hillah, south of Baghdad). Assyria had been settled around 3500 BCE by Semites (Arabians), though it was culturally dominated by Sumer. Its capital was at Assur, on the Tigris river. It rose to greatness around 1800, after having been taken over by an Amorite king, Shamshi-Adad in 1813. The Amorites were Semitic Arabians who had moved first to Syria. After his death in 1781 Assyria was twice attacked, and finally it was felled by Hammurabi of Babylon in 1757. It was then occupied by the Mitanni people from further north, to rise again in the 1300s, and then to dominate Iraq in the 1200s. Finally Assyria fell in 1076 - but it was yet to see another day. Babylon, the successor to Akkad, was founded by Amorites from Palestine around 1894. It was to become the world's greatest city, and twice it was at the centre of an empire. Hammurabi (king 1792-1750 BCE) united Mesopotamia, encouraging advances in agriculture, technology, literature and trade. Up to then, kingdoms had relied on the personal qualities of their rulers, exacting tribute from conquered territories while leaving governance to local rulers - a get-rich system which often fell apart once the king died. Hammurabi was the world's first monarch to practice consistent statecraft, systematising Sumerian-based common law, organising a proper administration and formalising the ancient Sumerian religious beliefs. The Sumerians had seen themselves to be in a relationship of covenant with the gods, who had come from the heavens to teach them the arts of civilisation. Some see this as evidence of an extraterrestrial relationship with Earth, but this confounds conventional prehistory and genetics so much that it is not even considered. Sumerian religion was fertility- and prosperity-oriented, sophisticatedly pagan. Each city had a patron deity. Hammurabi's Babylonian faith imposed greater order on these beliefs, conferring supreme power on the god of Babylon, Marduk, and emphasising divination, astrology and conformity with cosmic law. To Babylonians, people were servants of fate and the laws of heaven, located in a divine hierarchy that matched the authoritarian system of Babylonian society. This was the world's first state religion. Despite Hammurabi's and his successors' state-building efforts, a debilitating Hittite attack in 1595 led to Babylon being taken over by Caucasian Kassites. It entered a relative 'dark age' until 1415, when it saw a revival under a Kassite king. Then came several occupations and raids by nomads, Elamites and Assyrians, and other turns of events, all adding up to 900 years of insecurity. This led to Babylon's eventual destruction by Assyria in 689. Babylon had a very long history, with its ups and downs, yet it was consistently a big cultural, trade and financial centre, an ancient New York City at the crossroads of West Asia. Life went on in the world's most urbanised, civilised, developed region, despite everything and also because of it. The makeup of the region periodically shifted and kingdoms rose and fell: Iraq always would be multi-ethnic, multi-cultural and shifting in its power arrangements. Meanwhile, the Assyrians revived in the 930s, expanding to dominate the Middle East, often allied with Babylon. This later went wrong and they occupied Babylon from the 730s onwards, to hold off marauding peoples and gain access to Babylon's resources and markets. Sennacherib eventually destroyed Babylon in 689. He moved the Assyrian capital to Nineveh (near Mosul). Assyria was a centrally-directed military state with a solid administration, trade, iron-based technologies and impressive art, science, medicine and architecture - much more of a planned society. Babylon's strength had lay in its Sumerian roots, its liberal mercantilism, multi-ethnicity and focal location, but Assyria's strength lay in its centralist planning and its business and military strategies. When Assyria conquered states it installed governors and imposed strong governance, enforcing considerable social change, not least by deporting troublesome provincial ethnic groups (such as ten of the twelve tribes of Israel) to other parts of its empire, then importing other deportees to the vacated areas - by this means it gained control over fractious peoples. Finally, Chaldeans from Arabia took Babylon in 625 and, combining with the Medes from Persia, they felled Assyria in 612. Everything changed, once again. Babylon saw a revival under the Chaldeans. Nebuchadnezzar, a fierce conqueror, took over Assyria and the whole Fertile Crescent, destroying Jerusalem in 587 after a revolt and deporting many Judaeans to Babylon - this was an important formative experience for the Jewish people, causing them to review their culture and history and consolidate what now we know as the Jewish faith. He rebuilt Babylon, reinstating its Sumerian-style traditions, building palaces, temples, city walls and gates, processional ways, the famous hanging gardens, the Ishtar Gate and the ziggurat of Marduk ('Tower of Babel'). Legitimising himself through tradition and grandeur (Saddam Hussein tried this too), he made Babylon the world's richest and largest metropolis. After his forty-year reign (604-562) his successors fared badly. Within twenty years Babylon had degenerated. The end came in 539 when the new kid on the block, Cyrus of Persia, entered Babylon with virtually no fight, ending local rule in Mesopotamia and ushering in a new period. From now on, Mesopotamia stood between two new struggling powers, Persia and Greece. Its centrality continued for centuries, but things were never again quite the same. The Medes and Persians had originated in what is now Kazakhstan, sweeping south into Iran in the 700s BCE. Horsemen with bows and iron weapons, they were fast and furious in battle compared with the staid armies of the time. The Medes settled in northern Iran, adopting Assyrian ways, and later they took over Assyria. The Persians, their vassals, lived in southern Iran. In 550 the Persians, led by prince Cyrus, revolted, beating the Medes, taking their capital at Hamadan, merging the two nations and then invading Anatolia, Afghanistan and Babylon. Quickly Cyrus created the largest empire the world had ever seen. Cyrus was rather like an ambitious Mexican taking control of USA. People were by now so accustomed to invaders that they tended just to pay the tribute, accept the new overlords and restore normality. This symptomised a pragmatic attitude born of Mesopotamia's strategic vulnerability, leading to a certain inbuilt realistic pessimism in Iraqis lasting to this day, and applied as much to today's invading Americans as to people like Cyrus. He exploited this, giving the conquered peoples a decent deal to gain their cooperation and their wealth. In Babylon, he ended the decline of the city, to the relief of residents, and introduced reforms. Cyrus freed the Jews, many of whom returned to Judaea, though many stayed or went elsewhere - centuries later, Iraq had the world's biggest concentration of Jews outside Israel. Cyrus' successor Cambyses took Egypt, and Darius (521-486 BCE) took Sindh (India) and pressed hard at the upstart Greeks. The Greeks eventually repelled the Persians, stalling the empire's growth. Darius was a great organiser and financier, fixing fair taxes and administration, stable business conditions, ethnic and religious tolerance and major engineering projects. Mesopotamia, though no longer as central as once it was, enjoyed a refreshing stability through to the 330s BCE - except when Babylonia was briefly attacked by a rebellious Persian governor in 401. Then came a reversal for the Persians: the Greeks were suddenly on the rampage. In 334 BCE Alexander the Great and his forces, having blitzed Anatolia, Palestine and Egypt, swept through Mesopotamia, defeating the Persians, making Babylon their capital and pushing on into Persia, Afghanistan, Sogdiana and Sindh. This was a whirlwind campaign which ended only when Alexander's men grew tired of foreign adventures far from home. They returned to Babylon in 323, and Alexander died there at age 33, probably of fever and drink. His master-plan had been to modernise the known world with Greek ways and ideas and, in this, he left a big mark on the Middle East. Thousands of Greeks followed him, settling, founding cities and transplanting Greek culture, values and trade. This was a new and rather 'Western' kind of cultural imperialism, continuing for seventy years up to 250 BCE. A series of succession wars followed Alexander's premature death. Seleucos took control of Babylon and the former Persian empire. Founding a capital at Seleucia, near today's Baghdad, Seleucos caused Babylon's final decline. The Seleucids peaked for 30 years around 200 but then attracted the warlike attentions of the Romans, who were busy expanding eastwards. By 150 Seleucia was much reduced - nevertheless, the kingdom lasted 170 years. Mesopotamia might have become Roman were it not for the Parthians. The Parthians had moved from the Caspian steppes into northern Persia, staking out the state of Parthia in 238. In 141 they invaded Mesopotamia, moving their capital to Ctesiphon around 100 BCE (pronounced Tayspun, near Baghdad, which at that time did not exist). They adopted Hellenistic traditions and Seleucid-style governance, a 'regime change' with minimum disruption. Amongst other things, it hosted many early Christians, some of whom spread to India (with St Thomas) and even China (the Nestorians). Iraq's Christian heritage is older than that of Europe. Parthia lasted well, peaking around 114 CE. The Romans attempted a takeover but the Parthians outwitted them and pushed them back. Finally the Persian Sasanids overthrew Parthia in 225 CE, and another change came to Iraq. The Sasanids were ancient Persian revivalists. They moved into Ctesiphon and lasted four hundred years. Mesopotamia was rich and central again. Their empire was centralised, with the Zoroastran faith as a state religion - they persecuted non-practitioners. Society hardened: the Sasanids were hard-line conservatives, initiating a strict caste system and slowing cultural change in the Middle East. Culturally, this was an unexciting phase for Iraq. An ongoing war between Rome and the Sasanids depressed the area. It got worse after Rome's fall and the rise of its successor, Byzantium: Iraq was ripped apart by both sides and, in 627, the Byzantine emperor Heraklius destroyed ancient Nineveh. But then, the gears of history shifted yet again: the Byzantines withdrew, suffering troubles back home in Constantinople, and Sasanid Persia lapsed into civil war. Suddenly, a whirlwind blew out of the desert: wild Arabians from a (to most people) insignificant place called Mecca. They called themselves Muslims. This was the biggest event in the millennium between Rome's fall in 410 and the Renaissance in the 1400s. It started with a tradesman and psychic, Muhammad, in Mecca, the chief pagan cult centre of Arabia. By 622 his radical, monotheistic and rather political proclamations upset the Quraysh, the ruling caste of Mecca, of whom Muhammad was one. In 622 he and his followers had to move to Medina (the hegira, from which Islam counts its beginning), where they consolidated their faith, customs and community. The returned in force in 630. Muhammad ended the old order of feuding Arabian tribes in two years of military and diplomatic campaigns. When he died, the elected caliphs (successors) completed the unification of Arabia. Then came a fateful decision. To channel their warriors' energies, advance the faith, spread the revolution and gain resources, the caliph Omar (634-44) sent warriors north into the Byzantine and Sasanid empires. The Arabs rapidly took Palestine, Syria, Egypt and Iraq. The Sasanids fell and the Byzantines retreated. 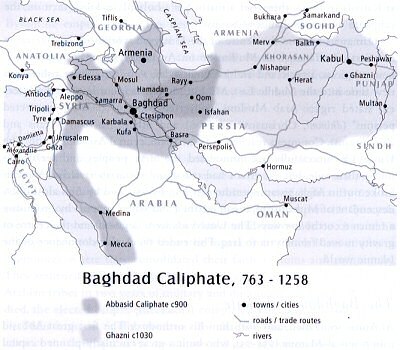 Under caliph Uthman (644-56) the conquest extended into Persia, Afghanistan and North Africa. Mosques and Muslim settlements were built across the Middle East. Enormous social and economic changes came about. The Muslims did not force conversion, but non-converts paid taxes while converts enjoyed tax-free privileges. The Christians and Jews of Iraq, Egypt and Syria were amenable to this, and to Islamic social reforms and the new trading opportunities that had arisen. But then succession troubles arose between purists (Shi'as) and pragmatists (Sunnis). Civil war broke out. In 661 Muhammad's son-in-law Ali, the Shi'a leader, was murdered, and Mu'awiya, a general from Uthman's Umayyad family, declared himself caliph (661-80). On Mu'awiya's death, Ali's son Husain and the Shi'as rose up and were beaten by the Umayyads at Karbala in Iraq - thereafter a major Shi'a holy place. From then on, the caliphate was in the hands of Sunnis. Damascus became the centre of the Umayyad world, run by Byzantine and Sasanid officials with Muslim bosses. An Umayyad renaissance created new religious, artistic and architectural styles, a fusion culture ushering a new time into the Middle East. Muslim society had four levels with different stated rights: Arab Muslims, converted Muslims (mawali), 'protected persons' (dhimmi, Christians and Jews) and others (such as pagans and Zoroastrans). Conquests reached as far as Spain, central Asia and Sindh. The Umayyads successfully accommodated the new peoples and territories under their rule, but the Arabs had tribal and sectarian rivalries. A revolt broke out in Afghanistan, spreading to Iraq by 750. Led by Abu al Abbas, a descendant of Muhammad, it gained Shi'a and wider support by promising a return to orthodox ways. The Umayyads were deposed, and the centre of gravity moved from Syria to Iraq. This ended the Arabic dominance of the Islamic world. Al Abbas soon died, and with him his orthodoxy. The first great Abbasid caliph was al-Mansur (754-75), who built a great circularly-planned capital at Baghdad, employing 100,000 workers to build it. During Harun al-Rashid's (786-809) and al-Mamun's (813-33) reigns it became the world's largest city, with a million inhabitants. The city of Mosul was founded near the former Nineveh. Ministries were set up, long-distance semaphore signalling systems, desert lighthouses and pigeon post were developed. Arabic dhows plied the Mediterranean and eastwards as far as Indonesia, and the Silk Road and other trade routes brought goods from far and wide to Baghdad's bazaars. Harun al-Rashid exchanged ambassadors with Charlemagne and the Chinese emperor. It was a time of prosperity, greatness, trade and stability. Baghdad saw Middle Easterners, Chinese, Indians, Africans and Europeans in its streets. Arabs, Jews, Christians and Persians were the main residents. Libraries and colleges were founded by scholars and lawyers from across the Muslim world. Greek, Latin, Persian and Hindu texts were translated, and great strides were made in medicine, mathematics, astronomy, physics, chemistry, geography and philosophy. Since Babylonian times Iraq had not seen such creativity and splendour. After al-Mamun things started disintegrating and civil wars broke out. Provincial emirs founded regional dynasties and ethnic tensions pulled the empire apart. The Abbasids retained nominal suzerainty, but the provinces became increasingly independent. In 836 the capital moved up the Tigris to Samarra. Muslim armies began to rely on Seljuk Turks, who gradually moved into influential positions. By 945, Egypt, North Africa, Spain, Arabia, Persia and Afghanistan were virtually independent. Baghdad was taken by Persian Shi'as, the Buwayhids, who ruled southeast Iraq and Persia until around 1000, when Mahmud of Ghazni extended his Afghan empire almost to Baghdad. Abbasid caliphs retained their religious primacy, in a papal sense, and the Muslim world kept its integrity even though divided. Iraq's centrality declined. Ancient Mesopotamian canals fell into disrepair, bringing environmental deterioration and desertification. The Ghaznavids were sent packing by Seljuk hordes, pouring down from Kazakhstan in 1037. Removing the Buwayhids, they made a power-sharing deal with the caliph, retaining him for his authority. Later they extended the Seljuk sultanate into Syria and Anatolia. After 1092 there was a Seljuk civil war and a mosaic of Seljuk sultanates appeared. Iraq was now ruled from Mosul. The European Crusaders took Jerusalem in 1099, and a succession of sultans took them on: Zangi of Mosul, Nureddin of Damascus and the Kurdish sultan Saladin, who at last recaptured Jerusalem in 1187. The Abbasids enjoyed a revival in Iraq from 1156 onwards. The Mongols had started campaigning in 1209, conquering China, Russia and East Europe, though it took them until 1258 to reach Baghdad. They razed the city, massacring 200,000 people and executing the caliph. The Abbasids and Baghdad fell. Mesopotamia's remaining canals were destroyed and much of Iraq was left as a marginalised wasteland. After the dust settled, there was a small revival in the 1300s, but Baghdad and Iraq were again attacked and laid waste in 1401, this time by Timurlenk (Tamerlane). These were bad times. Iraq was by now severely depressed. Mesopotamia was flooded in parts and desertified in others, creating today's relatively barren landscape. Environmental, agricultural and urban decline left much of the area to pastoral nomads - here was the beginning of Iraq's tribal societies, which were to figure strongly later on. Trade died off: the new European sea-lanes around Africa, established in the 1500s, killed Iraq's East-West trade, and the Silk Road declined too. Iraq became a battleground between Safavid Persia and Ottoman Turkey: the Safavids took Iraq in 1509, the Ottomans in 1535, the Safavids in 1602 and the Ottomans in 1638. It then remained a peripheral Ottoman possession for nearly three centuries until 1917, divided into three provinces, the Kurdish-Assyrian province of Mosul, Sunni Baghdad and Shi'a Basra. Since Ottoman attention was focused on the Balkans and Mediterranean, Iraq became a backwater. The chief local powers were feuding tribal sheikhs. But its holy sites at Kerbala and Najaf were important to Shi'as from Persia and Egypt - Shi'as maintained Iraq's centrality. In the 1730s, during a time of loosening Ottoman control, Mamluk administrators in Basra gained semi-independence. This gave southern Iraq stability and decent home rule, and it brought many improvements in the early 1800s, including a revival of canals and the encouragement of industry and foreign influences. This set in motion a longterm enmity between tribal conservatives and urban modernisers, which later was to divide Iraq. In Arabia, the Wahhabi movement of early Islamic fundamentalists, led by the ibn Saud clan, rebelled against Ottoman rule, attacking Kerbala in 1802 and Mecca in 1806. Beaten back by the Ottomans in 1812-18, their tradition nevertheless lived on amongst tribespeople. Southern Iraq was then ruined in 1831 by flooding and a plague, and the Ottomans re-occupied it. In 1869 a modernising governor, Midhat Pasha, reformed the army, secular law, education and administration, creating provincial assemblies and municipal councils. His land law reforms, replacing the feudal and tax-farming system with Western-style property-ownership and economics, turned many sheikhs into landlords, destroying tribal social structures and security. From now on a rich minority dominated the majority, who received a rough deal. Iraqi social unity was by now well broken. The Ottoman system was also in decline. By 1908 the Young Turks took power in Istanbul, imposing a secular turkification programme on the Middle East. This jump-started the pan-Arab nationalist movement: Arabs and Turks have always had an uneasy relationship. Basra became a centre for anti-Ottoman nationalists. The Ottomans kept control through the tribal sheikhs, exacerbating the conflict between urban nationalists and rural conservatives. Then in 1914 came World War One: Turkey allied with Germany, and the British and French eyed up the Middle East. The nationalists turned to the British, who promised independence after the war - they had taken Kuwait in 1899. In 1917 they invaded Iraq. In 1920 the League of Nations put Iraq under a British mandate. After an Arab uprising, the British agreed to the accession of a Hashemite monarch in 1921, Faisal ibn Hussein, son of the Sharif of Mecca. They favoured local tribal sheikhs over urban nationalists and fought the rebellious mountain Kurds, using chemical weapons. Iraq became a testing ground for new forms of airborne warfare. There was a new factor too: the British sought control of newly-discovered Iraqi oil. The British Mandate ended in 1932, but the discovery of the Kirkuk oilfield in 1927 led to British control of the oil industry. Oil dominated Iraqi politics from then on. Independence came in 1932. King Faisal died in 1933, succeeded by his son Ghazi. In 1936 Ghazi allied with other Arab nations, forming a Pan-Arab Movement. Some factions did not like this: there followed the Muslim world's first military coup, led by General Bakr Sidqi. He was murdered in 1937, and Ghazi returned, but the damage was done. Ghazi then planned to invade Kuwait, aiming to unite Iraq, Syria, Kuwait and Palestine. Ghazi was suspiciously killed in a car crash. The Kuwait invasion came to nothing. The new king, Faisal II, three years old, was to assume the throne in 1953. A pro-British regency under Abd al Ilah, with Nuri as-Said as prime minister, was supported by the tribal sheikhs. In the towns and the army, pan-Arab nationalism and government opposition grew, leading to a German-backed coup in 1941, replacing Faisal and as-Said with the ultra-nationalist Rashid Ali al-Gaylani. This led to the second British occupation of Iraq, and Rashid fled - not without a massacre of Jews in the process. Abd al-Ilah and Nuri as-Said came back. Then matters got complex. In 1948 Iraq joined the Arab war against the new state of Israel. This was costly, bringing the closure of an oil pipeline through Haifa and the emigration of 120,000 Iraqi Jews. In 1949 there were internal clashes over Syrian issues. In 1956 the British and Americans arm-twisted Iraq, Iran, Pakistan and Turkey into the Baghdad Pact, a military alliance to block Soviet expansionism, and the Suez Crisis further exacerbated tensions, isolating the pro-British Iraqi government. By 1958 it was overthrown by a military coup led by Abdul-Karim Qassem. Iraq became a republic, plans for Arab union were ended and Iraq left the Baghdad Pact. Qassem was unpopular, and there were revolts. The pan-Arab Nasserites and Ba'ath party sought union with Egypt, while Qassem aligned with Iraqi leftists. When Kuwait gained independence in 1961, Qassem laid claim to it, but a British military intervention blocked it. Qassem was assassinated and a series of military coups followed. By 1968 a final coup put Ahmed Hasan al-Bakr and the Ba'ath party in power. The oil industry was nationalised in 1972. During the 1970s troubles grew with Iran: there were border disputes, and Iran had supported a Kurdish rebellion in 1961. These matters were settled in 1975, and by 1977 Iraq's Kurds gained some autonomy. Iraq stabilised and grew rich during the 1970s oil boom. Saddam Hussein came to power in 1979, purging all rivals, imposing a totalitarian one-party state and reviving frictions with Iran - the 1979 Islamic revolution had recently deposed the American-backed Shah of Iran. In 1980 Saddam rescinded the border agreement with Iran and the eight-year Iran-Iraq war began. It cost one million lives, with missile bombing of Baghdad and Teheran and copious use of chemical weapons. It hardened and crippled both countries. The Americans supported Iraq, with the Europeans joining in. In 1988 Saddam Hussein's cousin, 'Chemical Ali', killed 5,000 Kurds in Halabja using chemical weapons. Attempts by the US Congress to impose sanctions on Iraq were quashed by presidents Reagan and Bush Snr. In 1988 came a UN-brokered cease-fire. Saddam Hussein didn't rest. Angered by Kuwaiti oil-drilling under the Iraqi border and seeking to reincorporate Kuwait into Iraq, he invaded it in 1990. Arab nations, feeling threatened, attempted to negotiate an agreement while USA acquiesced. Then USA suddenly declared an interest in protecting Saudi Arabia, since Iraq had gained a big stake in the world oil market and thus had a finger on the jugular vein of the world economy. Much was made of the Iraqi occupation of Kuwait, even though the Israeli occupation of Palestine and the Indonesian occupation of East Timor had been quietly overlooked - Western double-standards were showing themselves. The UN imposed sanctions on Iraq, later authorising a US-led military action. Operation Desert Storm took place in early 1991. The war lasted six weeks. The equivalent of seven Hiroshima bombs were dropped and over 100,000 Iraqis died. Iraq's infrastructure was destroyed, and thousands died of disease due to breakdown of water, sewage and health facilities. As the war progressed, American forces stopped short of taking Baghdad - US preferred a dictatorship to civil war, and its Arab supporters did not want democracy or Shi'a power in Iraq. American aims to control Iraqi oil failed. But instead, through applying sanctions, they removed it from the world market. A UN-brokered ceasefire was arranged, with conditions that included disclosure of Iraq's weapons of mass-destruction. Insurrections broke out in Basra, Najaf, Kerbala and Kurdistan, encouraged by USA, who then failed to support them. The Iraqi regime came down heavily on the rebels, sparking a Kurdish exodus of 2.5 million refugees. USA and UK imposed no-fly protection zones over northern and southern Iraq, to stop aerial bombing, but Saddam Hussein's regime survived. It even attempted to assassinate ex-president George Bush Snr in Kuwait, inviting a US cruise missile response during Bill Clinton's watch. Chaos broke out. Two Kurdish factions, PUK and KDP, fought each other for dominance of Kurdistan and, after requesting Saddam's support in 1996, KDP was given power. In 1994-95 there was a clash within Saddam's regime, leading to executions and suppression. Loyalists were sacked in favour of Saddam's sons. A key henchman defected to Jordan and, to undermine leaks, Saddam promised cooperation with the UN arms inspectorate - the defector returned and was executed. The regime wriggled out of trouble. The Iraqi opposition at home and abroad was divided and weak. France, Russia and other countries urged an easing of sanctions for humanitarian reasons, but US wanted to squeeze the regime. In 1996, the UN permitted $4bn oil sales per year and the import of essential supplies. In 1998 US and UK attempted to step up pressure, bombing Iraq for three years. Sanctions and the regime's spending on itself had by now crippled the Iraqi population and public services: UNICEF estimated that 500,000 children had died as a result. Then came 9-11 and America's War against Terror. Iraq was named an 'axis of evil' state. A war against Iraq was talked up, officially aiming to eliminate Iraq's WMDs, change the regime and remove a possible source of support for terrorists. Many saw these plans to signify a US interest in Iraq's oil reserves and a geostrategic move to control the Middle East - these, plus the ominous precedent of a 'pre-emptive strike' caused much opposition internationally. USA threatened to invade Iraq unilaterally, supported by UK, pushing the international community to support or acquiesce. In late 2002 UN resolution 1441 was passed, demanding a full Iraqi declaration of weapons stocks and unhindered UNSCOM access to suspected weapons sites, promising 'serious consequences' if Iraq failed to comply. UN inspectors returned to Iraq, gaining an amount of cooperation, finding nothing and requesting extra time, which USA refused. A split occurred in the UN Security Council: the US/UK plan was opposed by France, Germany and Russia, and by worldwide public opinion. US and UK went to war, arguing that Iraq's WMDs posed a threat to them. In March-April 2003, after a month of war and over 3,000 deaths, the Iraq regime fell. US and UK were suddenly faced with winning the peace too, in Iraq and internationally - this was to be a little more difficult. Ethnically, Iraq is about 75% Arab and 20% Kurdish, with Assyrians, Turkomans and Armenians accounting for 5%. Religiously, about 65% of the population are Shi'as, 32% are Sunnis and 3% Christians - the Kurds are mainly Sunni. The Kurds, mainly Caucasian by origin, are not genetically one people. They are characterised more by their mountain culture, around which other civilisations and invaders have moved. They are descended from the Halaf culture of the 6000s BCE and the Hurrians of 4,300 BCE onwards, with elements of Mitanni, Hittites, Kassites, Medes and Scythians. Over time they formed aristocracies and dynasties ruling ancient lands such as Pontus, Cappadocia and Commagene and, later, in Egypt's Ayyubid dynasty. The Kurdish core retained their identity by withdrawing into the mountains whenever threatened. During the Safavid and Ottoman period Kurdistan was split in two, losing all autonomy, and many Kurds were deported - here Kurdish nationalism was born. This division of Kurdistan went on for centuries. After the First World War, while Kurds understandably sought independence, Ottoman Kurdistan was divided between Turkey, Syria and Iraq, with some remaining in Iran and in a small enclave adjacent to Armenia in USSR. The Kurds were protected only by the mountains. In the 1970s, Iraqi Kurds gained limited autonomy which, after the 1991 Gulf War, became a de facto semi-independence. Turkish Kurds suffered immense suppression, leading in 1987 to full-scale revolt, escalating until 1995. Turkish Kurds, many of them dispersed as far as Istanbul, demanded equal rights or independence. In 1990s post-Soviet Armenia, the Kurds living there were ethnically cleansed from their enclave between Armenia and Nagorno-Karabakh. There are 25 million Kurds altogether. While they deserve a nation, the chances of getting one are slim, so autonomy and rights are their main objective. Independence calls for a re-drawing of national borders or a federalisation of the whole area, both of which Turkey in particular opposes. Shi'as are not a minority, but the Sunnis have until recently held power and cultural dominance - a leftover of Abbasid and Ottoman days. Shi'as are concentrated in the southern half of Iraq, focused in Basra, Najaf and Kerbala. Mostly Arabs, they share a faith but not ethnicity with Iranians - they were not necessarily supporters of the Ayatollah's revolution in Iran. Maintaining foreign Shi'a access to their holy cities is important to Iraqi Shi'as. Historically they go back a long way. In a democratic Iraq they would become the majority. The Marsh Arabs or Ma'dan are descendants of the ancient Sumerians and Babylonians. They used to number 250,000, but now, as a result of bombardment, disappearances and exile they number around 40,000. They live on the wetlands of southern Iraq between Basra and Nasiriyah, many on man-made reed islands with impressive reed buildings - though many of these wetlands were drained in the 1990s. They are Shi'as. They were independent of government control until the 1990s. The Turkomans number about 2.5 million, living mainly around Mosul and Kirkuk. Descended from Seljuk Turks who moved into Iraq during the Abbasid time, they were exploited as a buffer between Arabs and Kurds. Most are Muslims and some are Christians. The Assyrians, speaking Aramaic, are descended from the ancient Assyrians and Babylonians. They are Christian, located mainly in northern Iraqi cities, often serving as professionals and businesspeople, and numbering around half a million. Iraq has long been a central land, with very exposed borders. It has long alternated between home and foreign rule, and this dilemma presents a paradox typified in the current US occupation: speedy withdrawal might undermine the stabilisation of a new national consensus, but slow US withdrawal can look like an occupation and provoke opposition. Affecting this calculus is another question: the form of government Iraq comes to adopt. Iraq's gift is that it is a starting place for new possibilities - especially since the slate has been wiped relatively clean by dictatorship and war. Direct democracy-transplant or an Islamic republic are both probably inappropriate, due to the ethnic and religious/secular mix of the country, and the poignancy of the current situation. This emphasises the importance of a well-built and respected transitional government strong and impartial enough to hold Iraqi society together while it creates a new body politic and constitution. This could take time. Iraq has a surprisingly big opportunity ahead of it, potentially resolving not only its own, but also several wider issues. The fact is, both Western-style democracy and Iranian-style Islamic republics, the two main established options on offer, are becoming out-of-date - though both systems would deny this. Both systems would leave some people unhappy. It is clear that Iraq needs a federal constitution, allowing Kurdish, Sunni and other minorities rights amongst the Shi'a majority. However, a new formula is possible, standing somewhere between democracy and an Islamic republic. There is another matter waiting in the wings too: the reunification, or at least federalisation, of the Arab world or the Middle East. This is touchy territory, yet it represents a solution to many issues in the region. Whatever becomes the case, Iraq, the cradle or seedbed of civilisation, has an opportunity to create a new political format which could have a major effect internationally. Iraqis are a mature people, experienced in both secular and religious politics, yet their society is unstable, with shadows of dictatorship and foreign occupation to overcome. It remains to be seen how things will go. In comparison with Afghanistan, which languishes in a limbo to some extent, Iraq has two major assets: its centrality and its oil. Ironically, oil is itself a trade susceptible to decline, so this advantage will last but a decade or two. Oil proves to be a problem. As an easy source of income employing small numbers of people, oil wealth bypasses the need to build a sustainable economy and social structure. Whoever controls oil income controls the country, unless that income goes into trust funds guaranteeing broad distribution of wealth. In oil-producing countries, this has been done only in Norway and Chad. Iraq's oil wealth is potentially a cause for division, since most of it lies in Shi'a and Kurdish areas, or for potential further trouble. Long-exploited schisms between tribal conservatives, tending toward religious fundamentalism, and urban secular liberals, tending to distrust it, bode ill. Secularism is tainted by its identification with the West and with Saddam Hussein's regime, while fundamentalism, not noted for its tolerance and inclusivity, serves as a rallying-point for anti-Western Arabs. Iraq, under stable conditions, is an ideal seed-bed for wider reform and liberalisation of Islam, but such a realignment is probably not an option in the shorter term, even though Muslim tradition contains all that is needed for good governance and a healthy future. This requires objectivity, even-handedness and the laying to rest of old differences. It requires foreign powers to stay out of the way, while remaining present to contain and foster a new Iraqi consensus. Tricky. In the 1990s firm-handed justice and inclusiveness was achieved by the ANC in South Africa, but not without a full-term transitional government and a gifted leader eliciting broad trust. But in Iraq, many community leaders, obliged to reach accommodations with Saddam or to leave, have a tainted appeal. Theoretically, UN rule could supervise the transition, but UN's track record in Bosnia, Timor, Palestine and Cambodia has itself been mixed, slow and expensive, partially because UN's member states restrict its funding and freedom of action. In addition, USA seeks to dominate the nation-building process. But there are positive signs. Iraq has a source of development income if oil profits are fairly distributed and wisely used. The country has a mature population which, if permitted to calm down after a difficult period, has a potential for broad consensus. The Kurds, after internal disagreements, built a workable representative system with a moderate leadership which has been exemplary - so local precedents do exist. The heart of Iraq is its people and the social contract holding them together. The looting and disorder following the collapse of Saddam's regime brought angry young men to the forefront, corroding moderation and pushing the Iraqi people to manage their social affairs without the help of established structures. One redeeming factor here is that such a crisis creates solutions as much as it creates problems - it depends greatly on people's choices. Catharsis, the threat of social disaster and general weariness with hardship can concentrate minds and galvanise social unity, and here lies the Iraqi people's greatest potential asset - as long as irritations and gunfire can be held back sufficiently. Meanwhile, the rest of the world has an opportunity to get things right too. There is an opening here for cooperation between the West and Islam, for progress in Israel/Palestine, for Arab unity, at least in spirit, and for a re-legitimisation of power across the Middle East, as well as a general clean-up of world affairs. Logically, this looks difficult, but there is a payoff: Iraq, a key country, might one day be a very positive influence in the region. This requires the defusing of a buried, unexploded bomb: the gridlocked international complicity which has contributed to the rise and the maintenance of many of the region's ills. This focuses greatly on USA: by striving to control the world's oil, it seeks means by which to control the world's economy and particularly to threaten Europe and China, USA's main potential competitors, and two big oil consumers. But this focuses on the rest of the world too, and its tendency to go along with and thus reinforce these very same geopolitical control tendencies. Iraq's future is the Iraqi people's business - with facilitative help from the wider world. But the wider world's future is the whole world's business, and not just America's. The Iraq crisis of 2003 served notice that the hidden agendas, geopolitical complicity and multiplex corruptions of the late 20th Century have exceeded their shelf-life. Local crises can only truly be healed when the world as a whole enters a widespread healing process. Iraq could become a key player and standard-setter of the future. Since bombing and looting has destroyed much of its history, this gives a tragic opportunity to focus on the future. In a bizarre way, Iraq has a cleaner slate on which to draw its future than many nations ever encounter.